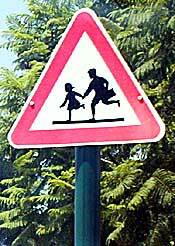 Interesting find, not only because this type of sign showing father with child is only rarely seen, but mainly because it learns us something about attitudes towards safety on the road. 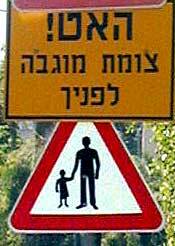 Compare the Israelian sign with the Hungarian version. The Hungarian man walks away from us. The man from Israel walks in our direction. That is the recommended behaviour. You must face the oncoming traffic so that you can jump out of the way when necessary. Notice also that the design follows the convention: both people on the panel should be of opposite sexes. We have an exception in Vietnam (two boys). Very ordinary design. We've seen almost identical panels in Shiraz (Iran), Italy and Amman (Jordan). One peculiarity though : the hair of the girl. The sharp spine is probably meant as a protection against an attack from behind.